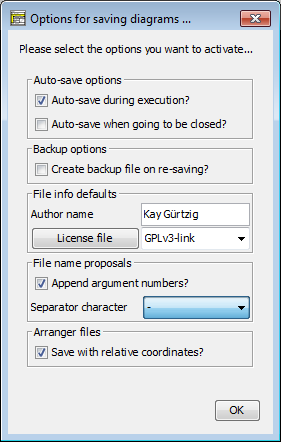 There are two options concerning auto-saving, another option related to file backups, and authorship / license options. Since version 3.29-07, there is an option concerning the file name proposals. Last but not least you can specify whether arrangements are saved with absolute or group-relative coordinates. Usually, Structorizer will ask you interactively whether you want to store unsaved changes to a diagram as soon as you are going to replace it by another one in Structorizer, on going to close a dependent Structorizer instance holding a "dirty" diagram etc. Sometimes these questions are raised simply for safety reasons since the changes will not necessarily get lost even if you refuse saving them now. But then the changes stay pending and you are likely to get the same question later again. This situation is particularly annoying when a diagram (with unsaved changes) being executed is going to call a subroutine. Similarly on closing Arranger or some Structorizer instances. on closing a dialog holding diagrams. The backup option addresses a behaviour that was introduced to avoid data losses in case an update of an existing NSD file failed. It could have happened that users ended up with an empty file. Therefore a twofold strategy was implemented: The old version of the file was renamed to <filename>.nsd.bak before the new version was saved. If you dislike the directory being filled with these backup files, then you may now opt out the creation of backup files by unselecting the checkbox "Create backup files on re-saving?". Even for the rare case that the saving might fail this is safe enough now because actually the backup file will still be produced but only automatically removed after the saving has successfully ended. These options specify, what author name is used for new diagrams and the "last modified by" diagram attribute on changes. The default is the system user name of your login. In the same section, you may specify a license text to be added to every diagram you design and save. 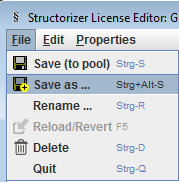 On the right-hand side there is a combobox allowing you to select the name of a license file residing in your "license pool" in folder ".structorizer" of your home directory. If there is none or if you want to create a new one from scratch or with a text from clipboard, you may enter a new license name. 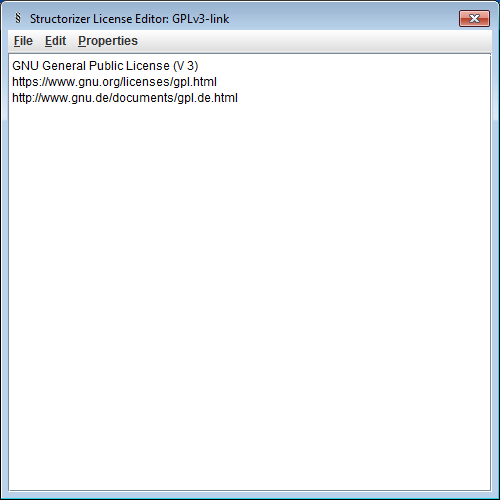 By pressing the button "License file" on the left-hand side you will open the Structorizer License Editor, which is a dedicated very simple text editor. You may enter, paste or modify the text (or link) for the selected license name, then either save it under this name in your "license pool" (<Ctrl><S> or menu item "File => Save (to pool)") or save a copy under a different name in your pool (<Ctrl><Alt><S> or menu item "File => Save as ..."). Alternatively you may rename the existing license within the pool (<Ctrl><R> or menu item "File => Rename ...") or may delete the currently presented pool license (<Ctrl><D> or menu item "File => Delete"). Via the Edit menu or keys <Ctrl><Z> / <Ctrl><Y> you may undo or redo last changes, respectively. Via key <F5> or menu item "File => Reload/Revert" you may discard all changes since last saving of the license text. leads by default to a file name proposal of demo_routineB-1-3, because the routine has at least 1 explicit argument and at most two of them. This name extension was sensible because you may overload routine names, i.e. if you work with several diagrams of the same name they are distinguished by Structorizer while their argument numbers differ. If the file name proposal would only reflect the name then you might inadvertantly overwrite one routine diagram with another if you aren't quite alert, despite you will be warned bevore overwriting a file.